New York, NY | December 6, 2018 Offit Kurman is pleased to announce today that Rod Biermann has joined the firm’s offices in New York City. Mr. Biermann will serve as a Principal-level attorney with the firm’s Labor and Employment Law Practice Group. He is the latest in a multitude of attorneys who have chosen to affiliate with Offit Kurman in New York this year. Mr. Biermann has experience representing employers, executives, partners, and professionals in a wide variety of employment-related claims and issues. His employment law practice focuses on three primary areas: representing employers, executive compensation, and sexual harassment prevention education. 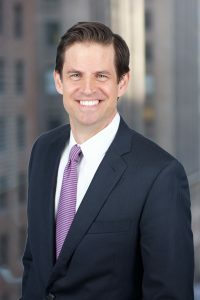 In his employment representation capacity, Mr. Biermann frequently acts as outside general counsel, handling a myriad of employment issues, such as internal employee claims, handbook review and drafting, termination consulting (including RIFs), and litigation of complex employment matters in both the Federal and State Court and in arbitrations and mediations. In regards to executive compensation matters, Mr. Biermann has significant experience in drafting and negotiating complex employment agreements from both the employer and employee perspective, including drafting and negotiating executive level severance agreements, employment contracts, and consultation agreements. Mr. Biermann has been advising his clients on sexual harassment prevention for years and, pursuant to the new law in New York, he has become an expert who provides companies’ employees and management with the tools to navigate the post-#MeToo-era workplace—through a customized and interactive presentation that also meets New York State’s specific legal requirements. Mr. Biermann is a frequent employment law lecturer and keynote speaker at conferences, legal bar associations (as CLEs), executive organizations, trade groups, committees, and companies. His speaking engagements have covered virtually every area of employment law, including sexual harassment education and prevention, executive compensation, discrimination avoidance, hostile work environment recognition and prevention, retaliation prevention, federal and state wage and hour litigation avoidance, reduction in force process, employee termination and hiring compliance and strategies, and severance and release drafting and enforcement. To learn more about Rod Biermann and to get in touch with him, please visit his attorney page. More information about Offit Kurman’s comprehensive legal services can be found here. For details and directions to Offit Kurman’s offices in New York, click here.